This summer, Slow Food Austin organized a series of cooking classes for kids between the ages of seven and twelve. I volunteer as a board member of Slow Food Austin and helped with the classes. This was the first time we’d done this, and we had no idea of what to expect. We weren’t sure if the kids would be enthusiastic or bored or what the parents would think. As it happened, the classes could not have gone better. The Young Chefs, as we called them, were excited about food and learning to cook, and the parents assured us the classes were informative and fun. It was great to watch kids interact and talk about food. A couple of the students compared notes about food and travel while discussing what they’d each eaten when they visited New Orleans. I was amazed at this food enthusiast kind of talk among seven year olds. Then, we couldn’t believe it when a little boy declared he was going to sell his Nintendo DS so he could buy a Le Creuset pot just like the ones we used in the classes. These were kids after my own heart. Since everyone who helped with the classes needed to arrive early for set-up, I made it a habit to bring along something for breakfast. For the last class, I had some late season Texas blueberries to use, and I found this Blueberry-Pecan Loaf Cake in Maida Heatter's Cakes . Unlike a dense and buttery pound cake, this one is lighter and filled with berries, nuts, and citrus. The fresh berries were washed and spread on a towel to dry. Once dry, they were tossed with a little flour. The rest of the flour was sifted with salt, sugar, baking powder, and baking soda. This cake batter included only one egg and two tablespoons of butter. Those were mixed with orange juice, and the dry ingredients were added. Last, orange zest and toasted, chopped pecans were folded into the batter. Maida offers a great tip by having you spread one-quarter of the batter in a prepared loaf pan and then folding the blueberries into the remaining batter. That way, there’s less chance of the blueberries sinking to the bottom. The remainder of the batter with the blueberries was then poured over the thin layer in the pan. The loaf cake baked for a little over an hour. Another good tip was to remove the loaf cake from the pan after it had cooled for ten minutes to prevent it from steaming in the pan which would cause a wet bottom crust. Don’t get me wrong, I do love a buttery pound cake. But, that’s just not what this was. This was laden with juicy blueberries and crunchy nuts and smelled lovely from the orange juice and zest. I had to add an orange and confectioners’ sugar glaze because I can’t help myself, but it wasn't even required. The slices of this loaf cake made a great, grab-and-go breakfast the morning of the last Young Chef class. Maybe we’ve started future chefs or food bloggers on their way, but definitely we’ve gotten a group of kids to talk about food and think about how to prepare meals at home. Fantastic! I can't dream of a better flavor combination. That's so great that you help with the classes. I like teaching kids, it's so fun. The glaze on this cake adds so much to it! I prefer more berry than cake so this would be perfect for me. Lucky kiddos- that cake looks scrumptious. And what a fun series. I'm hoping such classes are still around when Ruby is old enough to participate- hopefully she'll inherit our love of food. 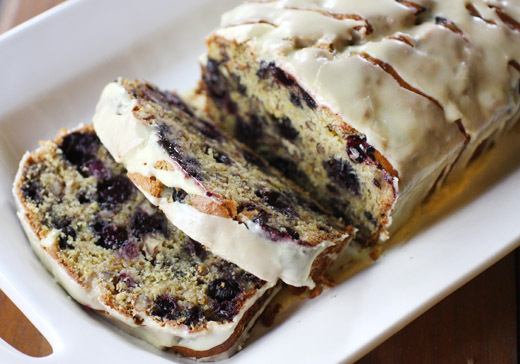 That Blueberry Pecan Loaf Cake sounds just perfect for enjoying with a cup of tea!!! Blueberry and pecan...a fantastic combo! I just made a blueberry dessert tonight, and already this recipe is calling my name! I'll definitely be adding this one to my list. This looks incredibly good! And the kids - how cute! That's amazing that he would sell his Nintendo for a Le Creuset. He has good taste already. The kids sound great, Lisa. It makes teaching a pleasure! Maida's cakes are divine and this is no exception. Loaded with blueberries and I love your addition of a glaze. The cake filled with blueberries would make me swoon with pleasure. 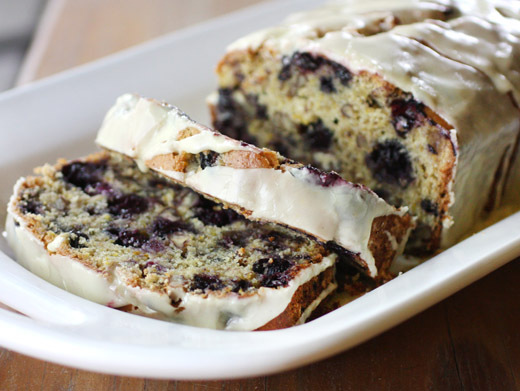 I LOVE blueberries in anything and this cake looks divine! This cake looks so good! I taught a jam making class with youth through my old job and I had the same exact feeling about it. Then the kids were actually really into it. That made it so much fun! That loaf looks amazing! 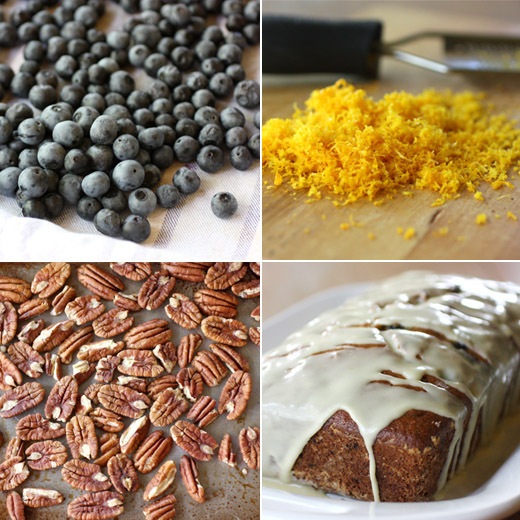 I love blueberries in baking and the idea of combining them with pecans is just genius. What a great thing you're doing! Congrats on teaching little kids how to cook. And such a nice recipe! I love blueberries in anything, but this dish is a particular winner. Aw, what a fun experience - very cool that you are volunteering :) And the loaf cake looks amazing! I actually don't reprint recipes from books without publisher's permission. You can sometimes find pages from books on Google Books (but not all books and not all pages are there). It might be worth a search though. Perfect Lisa. Looks like it would go very well with this boring cup of tea I have!